Eden left her house early Thursday morning. To her great dismay, ice rain from the ninth circle of Hell poured from the skies and transformed the whole town into a grand ice rink. Muttering under her breath, Eden cautiously walked down the steps and joined students in the trek up to campus. Within five feet, books and scarves and phones soared up high as their owners plunged and slid. Eden stood her ground as she watched dozens of her nameless neighbors fall onto their backs. Wide-eyed, the small Asian girl clutched onto her umbrella and stared very intently at the sidewalk. I will not fall, she chanted to herself. I will not fall. She reached the foot of the hill, but not before witnessing the tailbone-cracking slips of dozens of students. "Walk on the snow!" someone atop the hill shouted down. Some did not listen and tried to hike the incline. One after the other, the fools slipped and fell on top of each other. Even the ones attempting to get to the snow biffed it on the small stretch of sidewalk they had to cross to get to their starchy snow salvation. Eden made it to the top, and, like a boss, she texted the whole time. She had to warn her friends of the treacherous trip they would face when they leave the apartment. Hoping that campus would have at least salted parts of the sidewalk, Eden almost proceeded with greater confidence in her step. However, after scouting out the area, there were five bodies sprawled within a couple feet of the hill's peak. Eden thought about her best route. Should she risk yet another stretch of sidewalk just to get to the snow? She decided against walking on the ice and that the fools would have to do. They already broke down. So she did it. Eden leapt into the air and landed on one of the fallen. 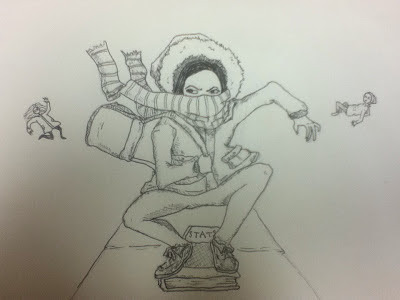 She skipped upon each of the bodies, like the ninjas do in those Chinese films, and landed on all fours into the snow. She was going to make it class, no matter what. But it was already past 9 o'clock. Eden swiftly grabbed her Stats book from her bag and decided this would be the fastest mode of transportation. Eden broke through the wintery air as she iceboarded on her textbook all the way to the Brimhall. She dismounted, did a triple back flip and landed on the doormat. Victory was hers and she laughed at the fallen fools as she entered the building. Almost everything in that story was true. There was a point where I completely made up because it would've been really boring if I just told it as it was. I'll leave it up to you to decided what was falsified and what wasn't. But on a more serious note, please be safe walking outside. It's horrid. Also, I had a falling out with my blog. I've just had some things to do, some new past times that I've taken up instead. Please don't be offended. And please be patient as I get better. Let me end this post with this. This is my friend Jenessa Buttars. I absolutely love her and her music. I saw her perform the other night with her band and it was just incredible. The fusion between electric harp and upright bass is one experience I will not soon forget. My friend SamYule drew this; titled "Ninjeden." Wait... but you are a ninja... lol.